Painted things that initiated commissions (wildflowers, etc.). It’s a nice domino effect, to share some art and have people want me to make more. Painted commissions for the holidays with ZERO advertising! Not once did I have to announce or market portraits. You people came to me. I kind of despise marketing so I got lucky this year. Read everyday. Read more. Read first thing in the morning. Less TV/screens. For my birthday in February, I am going to do my own kind of art residency. We are renting a cabin for a week and I’ll be making everyday I’m there. I’ll try to post more art on social media. I have a love/hate relationship with it, so I kind of avoid it much of the time. Start my 2020 calendar in January! Duh, I realized that I should do one or two images a month and have it done early, since this last two years I have not been able to make one. End my holiday portrait orders earlier. I kid you not, I end up delivering my last portraits on the 23rd or 24th and it’s just too stressful. Go with the flow! I really don’t want to plan out too much of this life. I was honored to be a part of the Pow! Wow! San Jose Festival. Painting a mural had been on my list of things I wanted to do and I have been needing a new and exciting project in my life. At first, I felt totally ready for it, knowing it was a big undertaking, but feeling like I would have no problem carrying it out. But after a couple of days of laying in background color, I started to see what I was really in for. Don’t these art studios look like they could use some paint? The Alameda Artworks had recently painted the doors and added the black awnings. It worked out perfectly to paint a day and night scene with the yellow and purple door colors. They are just close enough to the color scheme, but don’t totally blend in where you don’t notice them. I must say I love being on a lift. There’s something about driving around and working on a giant painting that is so satisfying. I sketched the mural idea out multiple times and with different colors and imagery, so going in I didn’t project my sketch on the wall. I decided to start with painting the sky and drawing the circle and figured I could freehand the rest. A little about the idea behind the mural. When I was offered two walls, I thought of dualities, specifically between male and female. I always loved painting diptychs (and triptychs and even up to 8 panels). I have been thinking about how we need more feminine energy in the world right now. How we need more balance and less chaos within ourselves. All of the plants within the circles are healing plants: saw palmetto, juniper, aloe, red clover, agave, burdock root, witch hazel, kava, cordycep and reishi mushrooms, lemongrass and more. It felt good to channel difficult feelings I have politically, environmentally and personally into this. The overall feeling people voiced is that the painting made them calm or relaxed. I think that was the point. I was pretty excited at this point, starting to see it come to life. I was offered the two big walls, but asked if I could also paint the center and top. At a certain point, I started to feel like I wasn’t going to get to the top, but a couple days before I finished I knew I had to make it happen. Friends came by and brought me mint from their garden. Another friend brought green tea multiple days. I will treasure all the friends and family who came by to talk, bring me treats or help. Here you can easily see how textured the wall was. The white primer is showing through and when I painted leaf shapes it’s not solid, not covering the surface. I kept telling people that a lot of walls that murals are painted on are more like the ocean, with waves in them, but this wall was like the earth with caves and crevasses. I had to push paint into the wall’s surface for it to go on smoothly. I soon discovered that foam brushes are the best thing for detail on a wall this size. I keep joking about how I can’t wait to do another mural, but I want to touch the wall before saying yes! As I developed the mural, I paid very careful attention to each color that was used. Here you can see the lower part of the circle on the left had a green background and the lower part of the circle on the right had an orange background. The ground on the right was also a pale pink. I was trying to really push my color choices with this mural. That green was too predictable for a landscape. You can see below the lower half of the circle on the left became a deep red orange. It was so exciting to mix this color and just try it and then cover the whole area. I had lots of visitors including a friend’s kid and her friend who helped me paint part of it. I would love to do a community mural at some point, where people can help me with the early stages. Roan and Sean of The Arsenal did this for their Pow! Wow! mural and it turned out great. A few things made my wall take an extra week from the allotted week: the textured wall made it super hard to paint details, I was going with an intuitive approach where I painted freehand on the wall rather than project or draw beforehand (except for the circles) and I changed colors on large areas a few times. Another reason is adding the upper level to the mural. If you know my work from some years back, I always loved painting A-frame homes so that peak needed paint. Another challenge is that the mural attracted a ton of visitors. I had forgotten about this aspect of public art. When I painted an electrical box years ago, people from the neighborhood stopped to talk to me. And when I sketch in public, people stop to talk to me. It actually takes quite a bit of time to talk, but I am grateful for all the visitors I had. I am used to working alone in my studio so it takes some getting used to. The final mural on each side. Working on this mural was really transformative for me. I have been wanting to paint bigger and this was as big as it gets. It made me realize how important color is to me. I guess that’s something I realize over and over again. And I see how long it has taken me to get here. This mural was really meaningful for me on a personal level. The themes explored here will definitely be explored in future work. I might even make a couple of large paintings similar to this day and night theme. I worked so hard on this. I worked 10-14 hours a day the first week, waking up early and heading out in the cold to get started. I stayed late with spotlights, hungry, tired and my legs aching. I took good care of myself. Everyday, I made a mushroom mate tea elixir, filled a few bottles of water and packed a nut and fruit mix. I made my lunch many of the days. It feels so good for me to eat healthy. The second week I stuck to an 8 hour workday until the last day when I was at the wall about 14 hours. I asked for help and had the best assistance from my husband, my friend Bella, my friend Laura and my friend Amy. I pushed myself harder than I had in a long time artistically. I totally needed this. Here’s the beautiful Pow! Wow! San Jose crew at a blessing ceremony with Calpulli Tonalehqueh. The folks behind the festival did an amazing job of bringing artists together with field trips, events and dinners. Truly an awesome experience. I have been super busy with client work between a wedding invitation and paintings of various subjects. I can't wait to share them when I'm done! I also hope to get some free art time this summer to work on personal work. I have lots of ideas I want to get to. Last weekend I taught a watercolor workshop at The Dancing Cat. I love their space! It's always amazing to see what they come up with, but I found this group to really impress me with their compositions, colors and style. We had a blast talking and painting with each other. I love my neighborhood and how we have lots of great things going on like this. I have been getting back into figure drawing these last couple of weeks. The poses were from one minute to twenty-five minutes. As usual, I find drawing women easier, but after working on the short poses, I got into working on drawing the male model. I am finding this to be really good for me. Even though I don't always paint the human figure in my regular work, it teaches you so much about form, light, composition and your style. I hope I can continue to make time in my schedule for this! 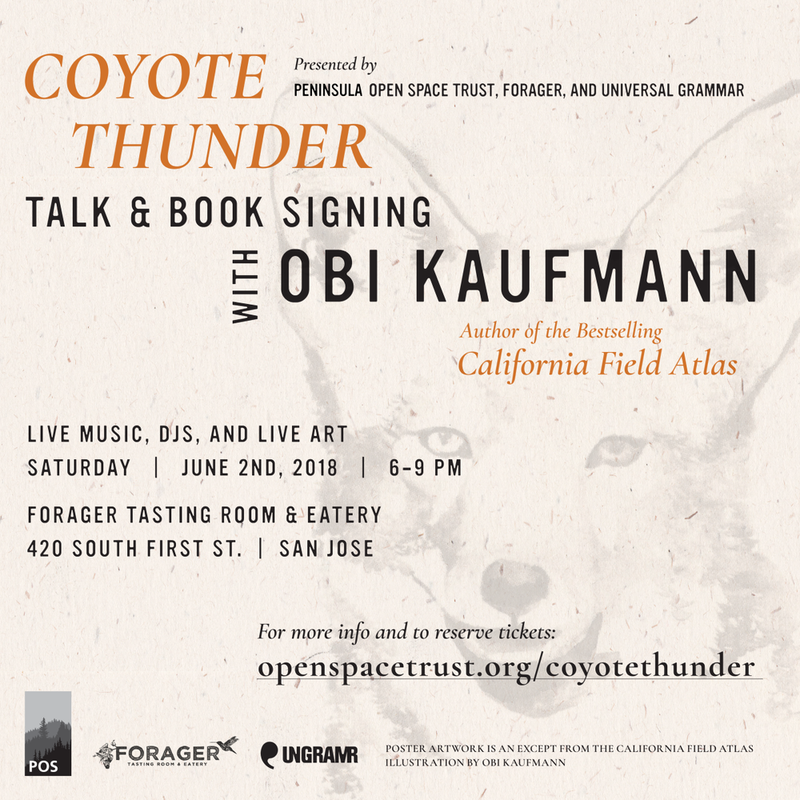 I already had tickets for this Obi Kaufmann talk and book signing at Forager in San Jose, CA. I even spread the word to friends and got them to sign up for it. So it was super exciting to be invited to do a watercolor table for attendees of the event. Guests will be able to make a small watercolor painting with me. 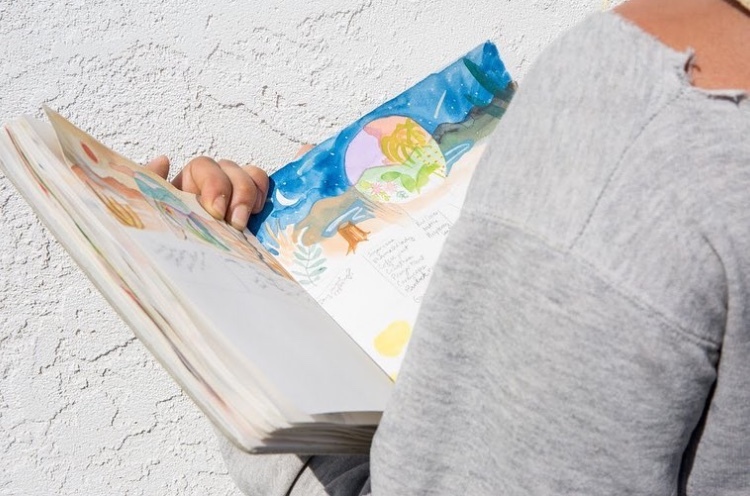 Obi Kaufmann is a rad backpacker and illustrator. He primarily works in watercolor and recently wrote The California Field Atlas. This event is in collaboration with the Peninsula Open Space Trust, an amazing organization that preserves natural space in the area. They will be working to fight against Measure B and preserve this special open space in San Jose, North Coyote Valley. Bring your love of nature and signup here! It's been a long time since I've written anything here. I've been wanting to get back to this blog, but it's just easier to post a quick photo on Instagram. Yet, I want to get back to it so here it is. A couple weekends ago, I spent time in the woods with my husband and dog. I am starting to think we have a knack for finding the best spots on Airbnb and VRBO. Sure, there are amazing $400 a night places that look like a dream, but the ones we find are way better than pictured and a lot less money. Our actual back deck view. We headed past the Golden Gate Bridge, which is always good in my book. I can't count the times I've said I could live in Marin or Sonoma County, which my husband laughs at. You'd understand why if you were familiar with Marin housing prices! They should give me a discount because, you know, my name :) This area has the best mix of ocean, forest, river, farm fresh food and seafood. Maybe all I need in the world. I loved this corner of the cabin: a purple and orange cat painting with records (including Patti Smith, Sam Cooke, Leadbelly and George Harrison). Listening to records while painting and looking at the view in the first picture was pretty much the best way to spend the day. With this painting, I wanted to keep it super loose and maybe even abstracted. I tried painting it once and realized the green chair was too big, so I started it over. It turned out way more detailed than I wanted it to be. I have been thinking about this lately. : how I want to keep things loose and wild, but they end up rendered and as they should be. Maybe I shouldn't fight how I naturally paint? There were a million wildflowers out: Indian Paintbrush, Douglas Iris, yarrow, poppies and many more. We tried to go on the Chimney Rock hike in Point Reyes, but they don't allow dogs. I plan on going back next weekend since the hike supposedly has over 90 types of wildflowers! This was one of the prettiest places I have ever been. The water was a mix of blue and aqua, flowers in full bloom and waves crashing around. I love these kinds of "you can tell the earth is round from up here" views. An imperfect photo of a perfect sunset in Stinson Beach. We stopped in Bolinas for beach time and dinner at my favorite Coast Cafe. Then watched the sunset along 1 at Stinson Beach. Best weekend ever!